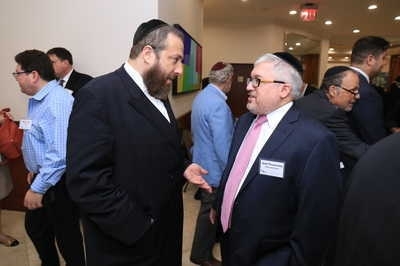 The Hudson County Jewish Business Alliance held its second annual legislative luncheon in an effort to strengthen the ties between member businesses and state legislators. The event was held Aug. 4 at the Empire Meadowlands Hotel at 2 Harmon Plaza in Secaucus. The annual luncheon provides the alliance's members with opportunities to forge relationships with business executives and state officials and legislative leaders. Assemblyman Raj Mukherji, D-Jersey City, was honored with the Excellence in Leadership Award, while Jersey City Medical Center/United Rescue received the Lifesavers Award. David Rosenberg, the director of the alliance, opened up the event by summing up the sentiment of the Alliance: "The HCJBA is here for you, to help your business." The HCJBA was founded by Rosenberg in 2015 as a community tool with the aim of enhancing Jewish business owners and providing venues for networking. Click through the photos above for a look back on the second annual event.